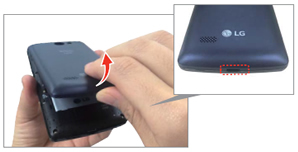 Press and hold the Power button (located on the top edge of the device). 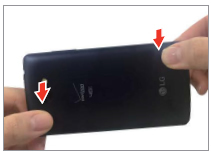 Drag the window to the bottom of the display to power off the device. Once the 'goodbye' message appears, allow up to 15 seconds for the device to completely power off. 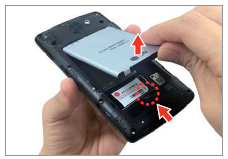 From the USB port (located on the bottom edge), gently lift and remove the battery cover.